One fall, I fell head over heels for the Asian persimmons we harvested from our front yard tree. Not only were the deep orange orbs on the leafless tree a gorgeous sight in November, but also many a winter meal was brightened with these versatile fruits. It was a bumper crop so we scrambled to learn how to use them. Now I’m hooked! 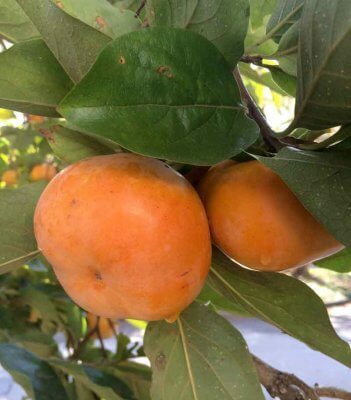 Our native persimmon, Diospyros virginiana, is what comes to mind for most people, with its astringent powers to pucker your mouth when biting into unripe fruit. This is due to the high concentration of tannins that will lose their astringent character as the fruit softens and ripens. The Asian persimmons, Diospyros kaki, tend to be categorized more often as non-astringent types, but be sure to check on the astringency when purchasing a tree. Most people prefer the non-astringent varieties as they can even be eaten when slightly firm. Suggested non-astringent varieties include Fuyu, Jiro, and Hanagosho red. The native persimmon is significantly more cold hardy than the Asian persimmons, which can be damaged at temperatures below 10 degrees. This is probably the reason the Asian persimmons aren’t more widely grown commercially in our Piedmont region, but homeowners can risk an occasional loss for an otherwise low-maintenance and productive tree. Flowering doesn’t generally occur early so losses due to freezing of blooms are not as common. For added vigor, drought and excess moisture tolerance, most Asian persimmons grown in the eastern U.S. are grafted onto D. virginiana rootstock. I like easy to grow fruits, like muscadines, figs and blueberries, because some other fruits may require regular pesticide sprays to get a good crop. But the Asian persimmons are relatively free of serious pests and diseases, which make them work well in the home landscape. Plus, their leaves are a brilliant bright red in the fall. They may be subject to the persimmon trunk borer, which bores into the trunk near the soil line, but if you keep a close watch and see a borer, you can remove it with a knife and incur minimal damage. The persimmon Phylloxera is a small insect that feeds on the leaves but typically doesn’t require treatment. 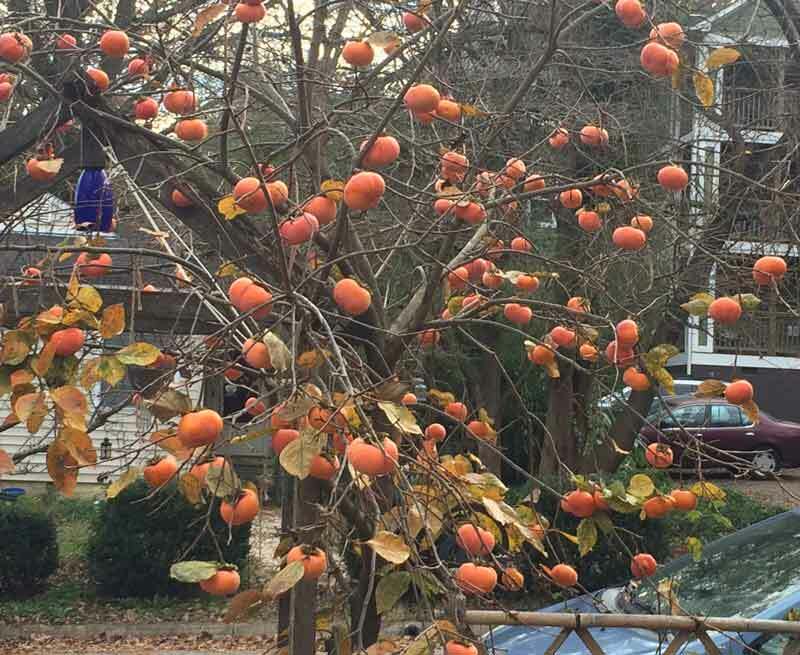 Alternate year fruit bearing may be the primary concern a homeowner will face in producing an Asian persimmon crop. While the varieties mentioned here do not require cross-pollination to produce a crop, the amount harvested in a given year may be affected by the crop load—a heavy load may abort so a light fruit set means a light harvest—along with soil moisture, tree age and other factors. In the last three years, we’ve had two light crops and one heavy harvest from our trees. Like most fruit trees, the Asian persimmon needs full sun to produce fruit. It’s a lovely tree so plant it out front for all to enjoy. Test your soil to have a pH of 6 to 6.5, adequate fertility, and make sure that it’s well drained. Handle the roots carefully when transplanting and plant it slightly above ground level so the graft union isn’t covered by soil. Pruning is done to remove diseased or excessive growth, and to renew fruiting wood as the flowers are borne on current season’s wood. The fruit can be heavy so prune to strengthen the branches and avoid breakage. So how do you eat this beautiful fruit? Any way that you want! We ate them while still firm, sliced like a tomato in our salads. You can eat them like an apple once they get to a certain level of ripeness, or wait longer and eat them like a juicy peach. The flavor when raw is not everyone’s favorite, but baking them in pies, puddings and sweet breads is sure to please. Cooked with butter and cinnamon, Asian persimmons make a side dish to replace sweet potatoes. Our favorite meal this winter consisted of persimmons sautéed with garlic and onions and served with chicken or vegetable dishes. The depth of flavor and rich color was loved by all. For detailed information, download “Growing Oriental Persimmons in NC” by Mike Parker, NCSU extension horticulture specialist.